Creative and stylish, Sanderson Designer Rugs offer the opportunity to revamp any décor instantly. 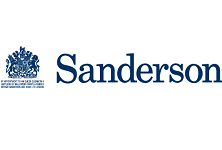 A leading home accessories brand, Sanderson produce high-quality products that enhance the appearance of modern interiors. Handmade, hand-tufted, or woven on state-of-the-art Axminster looms, these rugs combine top quality and durability. Their chic and eye-catching style makes them ideal to create a focal point in a neutral, minimalist décor, or to complement vibrant furnishings in an eclectic interior. You can choose between funky, traditional, modern, floral, or striped rugs, to suit any interior design scheme. Whether you prefer a more striking or more understated design, you can find the perfect product for your home amongst the elegant Sanderson Designer Rugs collections. Contact our trained sales team today! The Sanderson modern rug range features abstract patterns and elegant colours. These 100% wool rugs are a perfect choice for modern interiors, allowing you to add more character to a minimalist room and to create a focal point at the same time. Sophisticated and resilient, these rugs blend elegance and premium quality, while also bringing warmth and comfort into any room. Available in various sizes, the products from this collection suit smaller, medium-sized or even large, open-plan areas. A funky rug can make any room look more striking. These rugs from Sanderson are no exception. From unconventional stripes to vivid patterns bursting with colour or intricate designs inspired by exotic lands, this collection includes only eye-catching rugs that will stand out in any interior. Made of wool to a high standard of quality, the rugs from this range combine funky style with longevity. Select the ideal rug size for your home to add a chic finishing touch to a room’s décor. The Sanderson Designer Rugs with striped patterns defy convention with their creative design. A great choice for modern interiors, these rugs are elegant and versatile. The slightly muted colours add a touch of refinement to existing furniture and accessories, with palettes boasting many neutral tones to help you co-ordinate them easily with a contemporary décor. Resilient and durable, these 100% wool rugs offer the perfect solution to make a room look more stylish and feel more comfortable. If you’re looking for a refined rug to complete your home’s décor in style, look no further than this Sanderson Designer Rug collection. Created with a traditional design, these rugs blend into classic interiors with ease, but they also suit modern and minimalist interiors where they can add a sophisticated accent. In this collection, you can discover an array of intricate damask patterns and even stylised floral designs. The versatile neutral tones offer numerous décor revamping possibilities, while the rugs with splashes of colour let you brighten any room instantly. This collection includes gorgeous rugs that bring the beauty of nature into your home. You can choose between striking rugs that recreate the luxuriant charm of lush palm trees, or rugs that boast delicate poppies in a watercolour-style design. Stylised flowers, roses in bloom, or damask patterns are also included in this range. Vivid and elegant, these rugs are an ideal solution to create a stylish and welcoming décor in a classic or modern interior.